A selection of our most popular non alcoholic truffles in rich dark, creamy milk and yummy white chocolate. 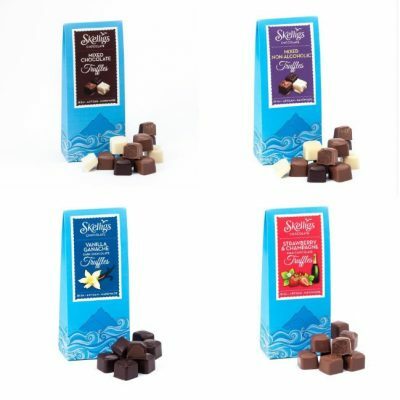 With flavours such as Hazelnut Praline, Vanilla Ganache, Citrus Delight and Raspberry & Coconut truffles. 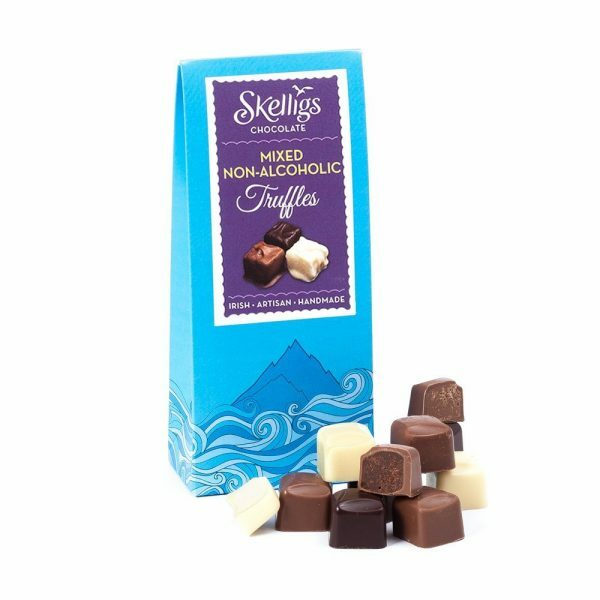 Milk chocolate 20% [Sugar 42%, Whole milk powder 22.5%, Cocoa mass 11.5%, Emulsifier: Soya lecithin, Natural vanilla flavouring]Dark chocolate compound 75%, [Vegetable fat (coconut, palm kernel) 48%, Sugar 30%, Fat-reduced cocoa powder 11%, Whey powder 10%, Emulsifier: soya lecithin, Natural vanilla flavouring], Hazelnut Paste [Hazelnuts 49.5%], Natural vanilla flavouring, White chocolate compound 63% [Vegetable fat (Palm, Rapeseed) 40%, Sugar 35.5%, Skimmed milk powder 13%, Milk sugar 10.5% Emulsifier: Soya lecithin], White Chocolate 26% [Sugar 46.5%, Cocoa butter 29.5%, Whole milk powder 23.5%, Emulsifier: soya lecithin, Natural vanilla flavouring] Lime zest, Lemon zest, lime oil, lemon oil. Min cocoa solids: Milk 33%, Dark 54%, White 28%. 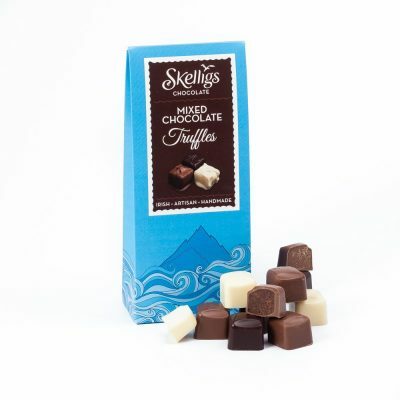 All our chocolates are made in one environment so may contain nut & wheat traces.